MEMOIRS OF SCHOOL STREET VILLAGE: growing up in a Portuguese Village in America: "IN THE END YOU ALWAYS GO BACK TO THE PEOPLE WHO WERE THERE IN THE BEGINNING"
"IN THE END YOU ALWAYS GO BACK TO THE PEOPLE WHO WERE THERE IN THE BEGINNING"
Recently, a mini-reunion took place between three friends whose friendship began in the first grade in the Village and continues over 70 years later. 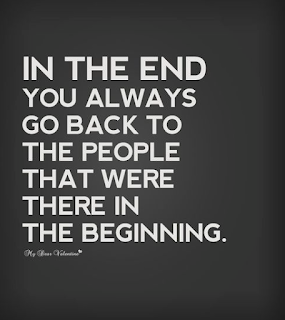 No matter how long an interval when we do not see or talk to each other, we snap back smoothly into the long relationship that just picks right up again. Up comes the laughter, the sad sharing of lost friends and classmates, the updates of families, and on and on. We have so much to share that the calypso recital of the ills of aging does not have room to flourish. We are too busy being young again. One of us had been cleaning out her "stuff" and found papers from when we were young students at Fuller School in the Village. The "stuff" engendered the opening of a whole lot of memory doors. We just tiptoed right into them. 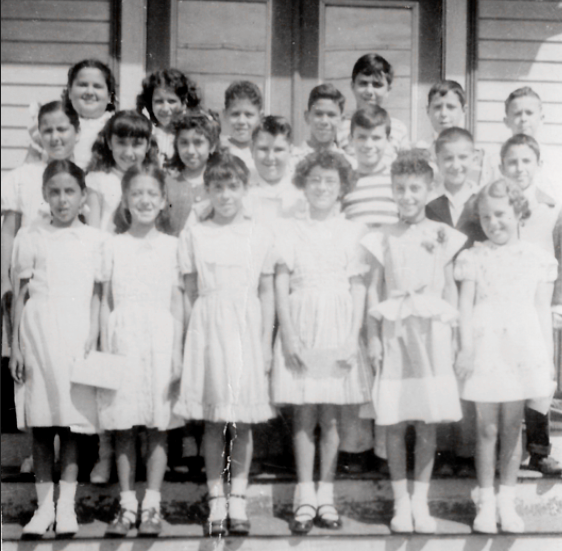 Guessing time...can you find us in this 1949 second grade photo? Bright eyed youngsters with all the world before us. 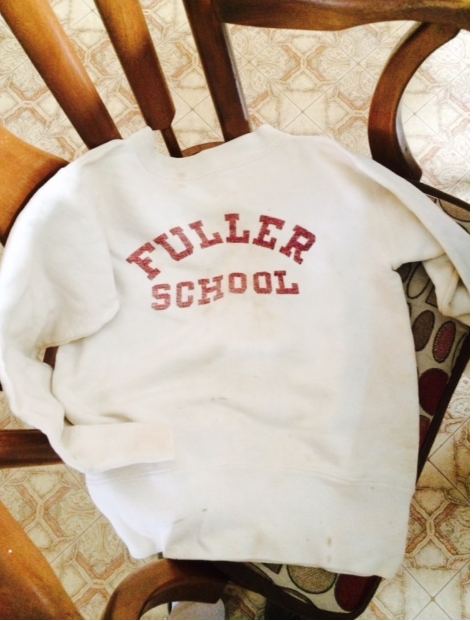 Imagine, we even had Fuller School sweatshirts back then! 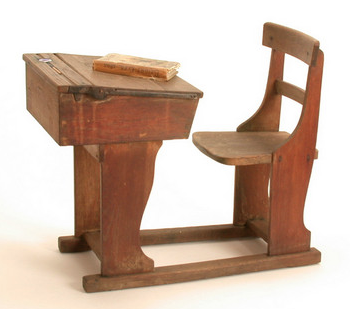 As we wrote in the last post, those times were very far away from the calculators and e- tablets for children in the classroom. We were there to learn how to write, how to understand our history as a nation. Every day started with the reading of the 23rd Psalm and the Pledge of Allegiance to our Flag. We were, and are, after all the children of the greatest generation. Geography led to dreams of far off places. It is amazing that many people today have no idea where countries are located -never mind the histories that were the root of many problems today. 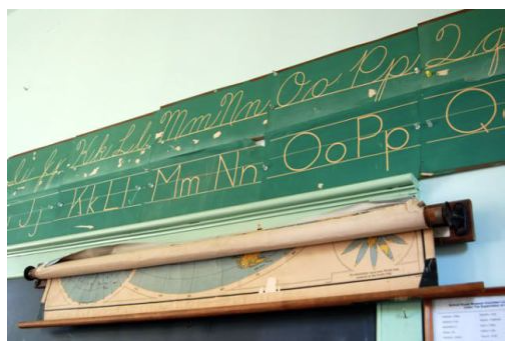 Remember those pull -down maps....the ratcheting sound they made coming down- and going up ?The cursive sampling like a border of wallpaper around the walls? One of our teachers would ask us to go and point to a country...you did not forget that country. Now, reading newspapers or listening to news reports you know exactly where it is located. How strange that with all the modern technology too many have turned in to their own little worlds. More is the pity. 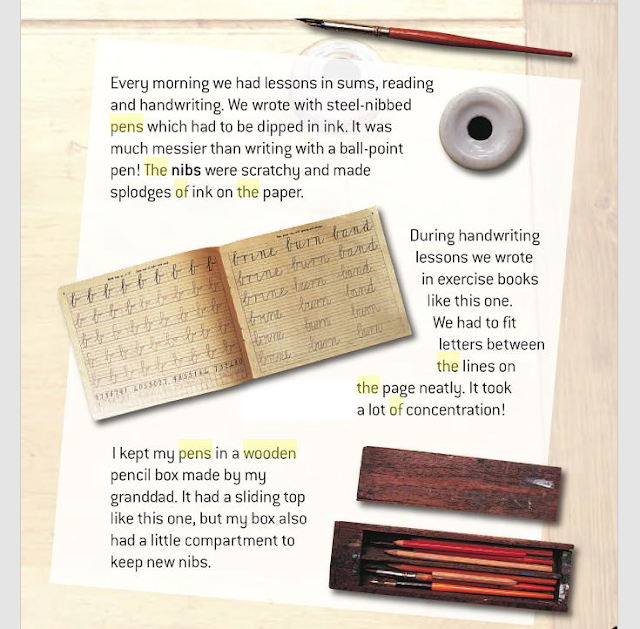 We also learned how to be thoughtful in the manner of writing. Psychologists are telling us that cursive writing can make us smarter and more thoughtful. I wrote a blog post about this very thing, if you want to read it, here it is. Witness the resurgence of scrapbooking and the calligraphy that is part and parcel of a whole renewal of hand-writing. Yes, there is an argument that it is right and proper to bounce out that cursive curriculum once and for all. Be sure, it will never go, it will simply pop up in adult optional classes. 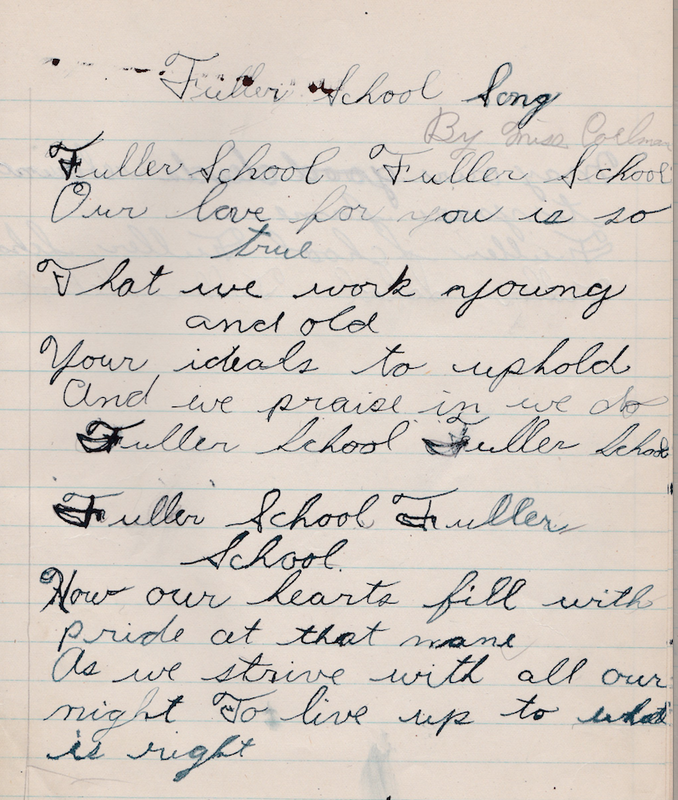 One of our trio found this in a saved paper notebook from 1950 hiding amongst the papers her mother had kept. I print it here because of the telltale splats of the ink from the metal pen nib dipped into the ink well set into our desks. We never knew that it was our dear Miss Margaret Coleman who wrote the Fuller School song but here it is. The writer of this page still knows the song by heart. note inkwell up in right hand corner. We painstakingly wrote answers to a spelling test in cursive. She was not only awarded a red 100 but also a flower sticker, a mum, so it must have been Fall. 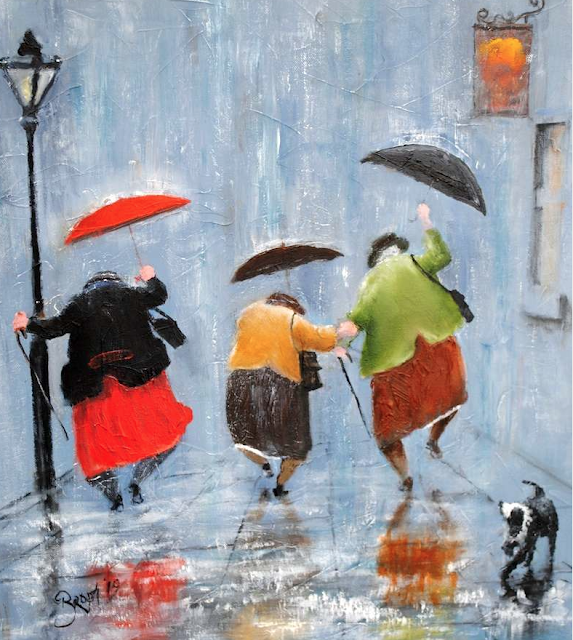 A whimsical painting by Les Brophy visually describes the three of us....always minus one more who is always kept close. What can describe a friendship like that? How can you do so when it winds and whispers around your heart through years and years and years? 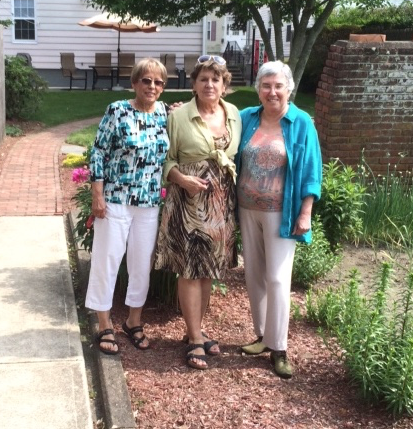 It is a friendship that makes you joyfully fall into it when you get to speak to one of these friends. We are far from each other much of the time. But distance, like the small fingers that followed a path and places on that old pull-down geography map is never a consideration. Come the rains and storms of life, we hope and pray that this blessing stays calm and endures. May your friendships be such as ours. Meanwhile, bring on the rain1 We shall dance as best we can!